When I say, "really cold weather," I generally mean below about 5 degrees Fahrenheit (-15C). I sometimes see these patterns at higher temps, but they don't really get good until the temps really drop. I've also noticed that we get the best patterns when the temp drops a fair bit overnight. If the weather has been consistently below 10F all day, the resulting frost will be solid and generic. Armed with this knowledge, I've been able to plan my frost photography around the weather forecast and wake up early rather than being surprised when I'm scrambling to get the kids to school on an already hectic morning. The scale of these scenes ranges from an entire window pane (30" wide) to less than one inch, depending on how much detail I want to capture or how well the entire pattern works as a single composition. I photograph the full gamut of sizes, but I always tend to gravitate toward compositions that replicate macroscopic scenes on a microscopic scale, such as a Christmas tree, or holly leaves, or a bird in flight over a forest. To capture shots of that size, I use one of my two old, manual-focus macro lenses: a Nikon Micro-Nikkor 55mm f/2.8 AIS or a Tamron 52B 90mm f/2.5 (M42 screw mount). Both of these are mated to my Canon 7D body. Both of those lenses will focus down to 0.5X natively, so I keep some short extension tubes handy in case I need a really tight shot with the Tamron. At the small scale of these compositions, I need to have the camera axis perfectly orthogonal to the window surface. If the camera axis hits the glass at even a slight angle, the edges of the image will be noticeably out of focus. I have to eyeball the left/right angle, but the camera's built-in electronic level helps with the top/bottom angle. To retain maximum sharpness and a decent depth of field across the frame, I typically shoot at around f/8. I sometimes go wider if I need to blur the background outside the window. I might go narrower with the Micro-Nikkor if I know that the camera is a bit off-axis and I need some extra DoF. Unfortunately, the Tamron's ugly blue spot shows up if I shoot a backlit image at smaller than f/8. frost than any other in the house. As with any static macro shot when detail is critical, I shoot on a tripod at ISO 100 with mirror lock-up and a self timer (or cable release). I love the flexibility that my Manfrotto 055XProB tripod gives. I'm frequently reaching over the kids beds and leaning on window frames, so individually-angled legs are a necessity. One tip: raise the center post up a couple inches before positioning the camera legs. If you compose the shot & find that your camera is 1/2" too high (remember what I said about keeping the lens axis perpendicular to the window), it's a lot easier to lower the center post than to shorten each leg. A multi-axis focusing rail would be great for this sort of work. Since most autofocus systems simply aren't precise enough for macro work, most macro photographers focus manually even when using AF lenses. My macro lenses pre-date the AF era, so I don't have a choice. 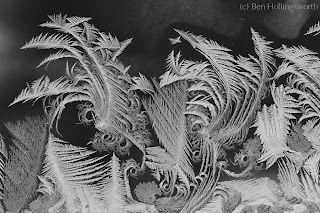 I originally started photographing this frost with my Canon Rebel XTi (400D), but even with my split-image focusing screen, the small viewfinder made it difficult to achieve critical focus on such tiny scenes. The LiveView feature that all modern bodies have, with its 10x magnification, was a true godsend. I no longer have to worry about accurate focus, and can concentrate on composition and exposure. Any time you're shooting a transparent, translucent, or highly reflective object, you'll find that you're not really photographing the object, but rather the light that interacts with that object. First, turn off (or down) the room lights and close the bedroom door so you don't get any reflections on the window from the indoor lights. In general, the frost patterns show up better if the outdoor background on-axis with the lens is darker (like a pine tree) rather than lighter (like a clear sky) because you get better contrast within the frame. If the light outside the window is a heavily overcast sky, the frost patterns won't really stand out, and the color will usually be fairly monochromatic. In these situations, I expose so that the histogram hump peaks about 1/3 or 1/2 way down from the bright end, then plan on using a curves tool to play with the contrast in post. Bird flying over a forest? If the back light is somewhat bright & directional, but still diffused, such as a sunrise through haze, you can capture some high contrast shots with great detail. There will probably be more dramatic colors outside the window thanks to the brighter light, and these areas of color can refract differently through different parts of the scene, which highlights the texture in the frost. This lighting doesn't usually last long, so you have to work fast. If the frost is backlit by direct sunlight through a clear sky, every single ice crystal will reflect the light straight at your lens. It's impossible to get tight, detailed shots of small scenes, but you can still get decent pull-back shots of a larger pattern. The reflected sunlight will add a distinct yellow/orange tint to the entire scene, which is a dramatic change from the blue tint that everything had just moments before the sun broke into the clear. I generally don't care for this type of lighting. Some of the most dramatic shots I get are taken in the dead of night, looking out onto the busy intersection and commercial complex that stretches for several blocks to the south of our house. There are lots of different colors to be found there, and they change every few seconds as headlights, traffic lights, and business signs change. You can shoot the exact same composition for five minutes straight and never get the same image twice. Because these traffic lights are much dimmer than the dawn sky, exposures at ISO 100 & f/11 can be as long as 30 seconds. I'll sometimes jump up to a higher ISO or wider aperture, with the corresponding shorter shutter duration, so that the traffic lights don't change on me during a single photo. I usually try to keep my frost shots as natural as possible with only slight enhancements to show off the detail. That usually means that I start out with a daylight white balance and expose such that the histogram is near the middle of the range. This gives me the most flexibility when adjusting the exposure to my liking in post. I almost always use the curves tool to enhance the contrast somewhat. Sometimes it's just a tiny bit, but if the original back light was pretty bland, I might go farther. Applying a touch of the clarity tool (an unsharp mask with a large radius and low power) will also improve contrast an enhance details without blowing out your highlights or shadows. If the background light was both dark and light in different parts of the frame, I'll sometimes use a layer mask to adjust the exposure in just part of the image to even things out and let the viewer concentrate on the frost detail rather than the background variations. Some scenes, especially those with lots of hard edges and sharp detail, will become a high contrast, black & white image resembling an engraving or pencil sketch. On very rare occasion, if I'm looking for something a little different than what the daylight white balance gave me, I'll sometimes play with the white balance setting to give the image a blue or orange cast. However, a daylight WB often gives a blue cast to these pre-dawn images already. 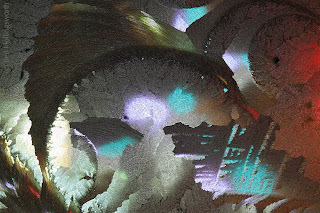 Frequently, I'll see hints of really good color in an image that I wish were more prominent. Many of my frost images have had the saturation or vibrance turned up 20% or more. On rare occasions, I'll throw realism to the wind and crank the saturation up to 11 just to get a different look. A 16x20" print of one such image (at right) hangs in our church library. Even in those situations, I'll keep the natural colors--just more of them. 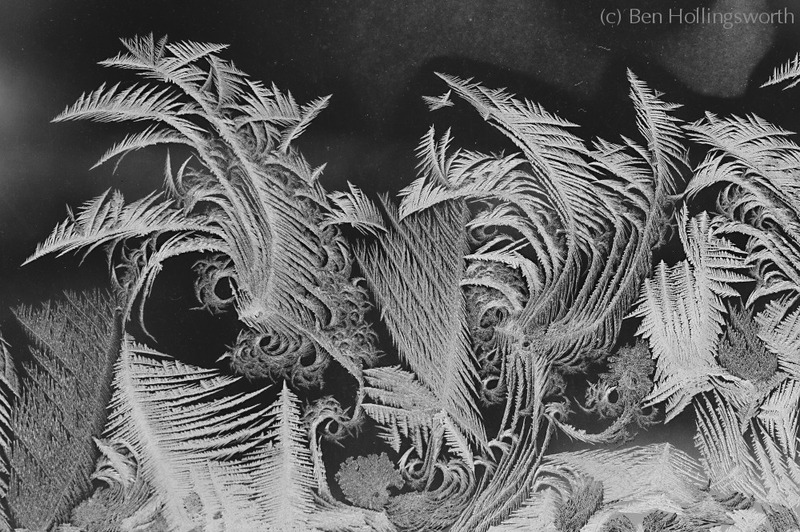 And finally, as is usually the case regardless of subject matter, every single frost image I make has benefited from some degree of small-radius sharpening, regardless of whether it's for printing or online use. I do most of my editing in Corel AfterShot Pro, digiKam, or the GIMP, but these are simple procedures that can be handled easily by virtually any image editing package, such as Photoshop, Aperture, or Lightroom. Alas, this will probably be my last winter in this house, as we're in the processing of building a new house out on an acreage. It'll be great, but one of the things I'm going to miss most is the window frost. I'm already scheming ways to replicate our window conditions at the new place. My current plan is to build a box in which is mounted an old, single-pane window and an old storm window, just like we have in our current house. On cold nights, I could open one of our new, super-efficient windows and hang this box in the opening. That would likely produce the frost, but unless I have interesting back lighting, the resulting images will be worthless. The sun will rise at the acreage just as it does at the old house, which is a good start. Replicating the city lights at night could take some more creativity, perhaps involving gelled speedlights or light painting with flashlights. I would love to know how all these patterns form. I've tried several times to capture the process by making a time lapse series all night, but all I've ever gotten has been 130 identical images of a solid, patternless window. I think having the window shade raised affects the frost formation. I'll definitely try again soon. On a related note, if you'd like to learn more about macro photography in general, there is no better book than John Shaw's "Closeups in Nature." I borrowed a copy from my local library and loved it so much that I bought my own copy. So there you have it--all the dirty little secrets of my prized frost photos. Hopefully, this will inspire you to take a closer look at the world around you before you rush off to work or school this winter. There's beauty to be found everywhere! What's been your favorite macro discovery in your everyday world? Please share in the comments below. Definitely a great collection of window patterns, we offer frosted window film service and what you have is a great addition. I’m sure you inspire lots of us to go out from the box and bring the CREATIVITY on and do something new. Grats!